A series of coincidences led to my taking another look at the Chabad-run site Askmoses.com. A couple of friends of mine are getting married this fall and, partly as a result, this question and answer by Rabbi Moshe Miller caught my eye. The questioner asked, "Why do people throw sweets at the groom [at the synagogue] on the Shabbat [Sabbath] before his wedding? The candy throwing ritual is known as an "Aufruf." It is customary to call up (aufruf = the Yiddish word which means to call up) the groom to the Torah on the Shabbat before the wedding. After his portion is read and he has recited the blessing after reading the Torah it is customary to sing and rejoice together with him. The congregation then throws nuts and candies at the groom as a blessing that the couple should be fruitful and have a sweet life together. (The candies are soft so no one will be injured). I've heard it said that they pelt the young man with bags of nuts and candies so that any hard knocks due to him are already fulfilled by those who love and respect him, and even those have a sweet ending! According to the Zohar, the blessings for the entire week emanate from the Shabbat beforehand. Furthermore, since Torah is the root of all blessings, we call up the groom to the Torah on the Shabbat before his wedding, to shower Torah-blessings on the auspicious upcoming week. The entire ancient custom seems to be related to the statement in the Talmud [Berachot 6b] that everyone who brings joy to a groom is worthy of Torah (and this is why it is done when he is called up to the Torah). After the services, it is customary for the family of the groom to sponsor a sumptuous Kiddush in honor of the soon-to-be-married couple. The bride does not join the groom’s festivities because the bride and groom do not see each other for an entire week before the wedding. Instead, it is customary for the bride to have a festive gathering for her friends on this same Shabbat. This event is known as the “Shabbat Kallah,” or in Yiddish it is known as a fahrshpil. Sephardic Jews generally do not observe the aufruf custom. I ran across the following in the 1900 Union League Club annual report. The section of the report related to the Committee on Library and Publications reminded me that this was written during the Philippine-American War and the Second Anglo-Boer War. So what did they do before cable news? Books, serials and maps. ...your Committee unanimously resolved to return to ... expending in the purchase of new books, as distinguished from serial literature of any description, a reasonable proportion of the funds... especial reference has, of course, been had to timely publications, like books on the Philippine Islands and South Africa. Your Committee feels that mention should here be made of the very beautiful and cartographically accurate maps of the Philippine Islands and of South Africa now posted in the Club-house, which were prepared by the War Department and sent to the Club by the courtesy of the Secretary of War; and also of the map of South African territory procured by the Committee from London. By placing a number of small flags upon these maps to indicate the location of the various troops, and by changing them from day to day, as advances or retreats are made, it has been found that the interest of club members in the different campaigns has been stimulated. This method of illustrating the progress of a war is quite general in the London clubs, but has never before to our knowledge, been used in any New York club. 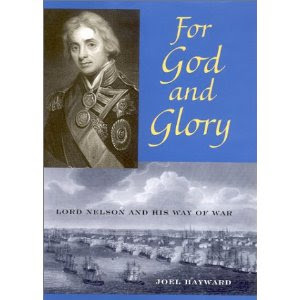 The English hero [Lord Nelson] was thoroughly devoted to the established church of his nation and was a Protestant by both inclination and practice. ... He appreciated the Neapolitans' Catholicism and certainly never let religious differences interfere with his zealous diplomatic efforts to keep Naples on Britain's side in the war. He was always respectful to Catholic dignitaries and went to great lengths to ensure that they knew he would defend their Church and its role in Catholic nations. He also demonstrated tolerance in a number of small-scale ways. For instance, he willingly acceded to a request from the queen of Naples for the discharge of one of Capt. Thomas Masterman Hardy's marines, who was a Catholic priest by training, so that he could serve in her kingdom. And when in 1804 he gave gifts to the Catholic residents of the Maddalena Islands to repay their hospitality, he chose church plate (a silver crucifix and candlesticks) for the local parish, a gesture that prompted the startled parish priest to cut short a trip elsewhere so that he could thank Nelson personally. The priest even promised, in a gushy letter, ever after to offer daily vows for Nelson's long life, prosperity, and glory. Nelson also bemoaned that the frail and unwell Pope Pius VI, whom he had often hoped would join the war against atheistic France, had been deported to Valence (where he later died). It "makes my heart bleed," Nelson lamented. When the new pope, Pius VII, returned to Rome in 1800, Nelson wrote him a congratulatory letter. He explained that he himself played a part in making the Catholic Italian states safe for the pope's return. "Holy Father," he added, "I presume to offer my most sincere congratulations on this occasion; and with most fervent wishes and prayers that your residence may be blessed with health, and every comfort this world can afford." This was no mere polite letter to a distinguished personage to praise him for good fortune. The letter had a curious religious purpose; the admiral felt compelled to tell the pope that in 1798 a priest had predicted Nelson would, by providing naval assistance, play a key role in Rome's recapture from the French. This had "turned out so exactly," Nelson said, that he felt the pope should know about the "extraordinary" consonance between the prediction and the outcome. That return to Rome was the one that inspired the Feast and Month of the Precious Blood, as was discussed in a previous post. Hayward was also caught up in a lengthy debate about his Master's thesis and holocaust denial. See his old web site here.